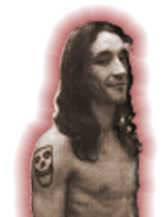 The vampire Cliff Burton has drunk 190270 pints of blood. Cliff Burton is a master vampire, with no sire. cliffburton stalked the city streets before there were any. Cliff Burton is a master vampire. Cliff Burton is fully powered. The vampire Cliff Burton is roaming RavenBlack City quite a long time, rumours say he was even a city founder, leaving for an unknown destination, but was seen already again shortly after "the City" was first run over by vampires. But he kept a low profile until he incidently started A View In The Dark, spawned from a jolly mood by drinking Demon Blood mixed with Malzbier and Cherry Coke. He has no clan involvement nor is he interested in doing so as he thinks about himself as an intependent observer. But he likes to bring free information to those who seek. Maybe that's not in the interest of some but he doesn't care about that. Conducted on June 4, 2011 by †Occamrazor. An Aria Pro II SB-Ltd Bass guitar. Cliff Burton loves to read. Cliff Burton likes to collect books. Cliff Burton has a number of bizarre sexual fetishes. Cliff Burton knows the first two rules of Fight Club. Cliff Burton loves sharp objects. Cliff Burton loves to watch movies. Cliff Burton loves to listen to music. Cliff Burton plays a musical instrument. Cliff Burton has a piercing. Cliff Burton has a tattoo. He is played by the mortal Marco Spadafora who lives indeed in Germany. Both, player and character, share the same interests, (non vampyrical) skills and physical appearance. This page was last modified on 3 May 2017, at 15:20.